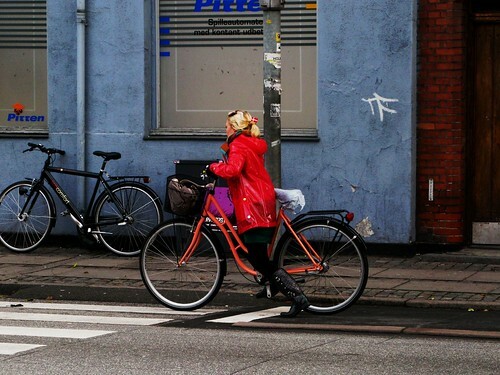 A Copenhagener launches her bicycle into motion. She has a little Danish flag - Dannebrog, the world's oldest national flag - in her hair. I'm guessing she's heading to a birthday or other celebration. 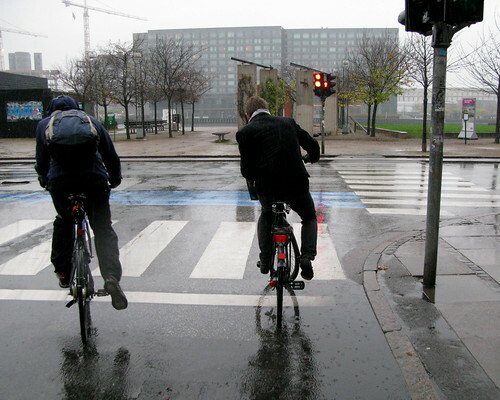 Two Copenhageners launch off the lights in the rain. That magical moment when human powered transport begins. So, how do you get these photos? Are you just a straight stalker, or is there entire army of cycling stalkers? considering the number of guest contributors on this blog, from all over the world and of both sexes, I suppose we're a whole army.